When you read this letter to Eddie Lampert, the notorious head of Sears Holdings, you'll understand why I was inspired to write it. There is a small part of me that is afraid I may hurt your feelings with what I am about to say. However, I’m going to ignore that small part, because you need to hear this. You have completely destroyed Sears. That iconic American brand—you have driven a stake through its heart, ripped it to pieces, and set those pieces ablaze. The company is an absolute goner. Many people would say that this was your goal all along, and if it was, I am here to tell you: Mission accomplished. Wait. I need to be more specific. Somehow, you have managed to fracture Sears into a million tiny pieces, each of them completely disconnected from the others. So that delivering customer service is not only difficult, but downright impossible. How do I know this? Because my husband and I made the tragic decision to purchase a refrigerator from Sears. And then, we—I shudder to remember this now—asked to have the hinges and handles changed to opposite sides. This is supposed to be a very simple and quick procedure, free if requested within 30 days. The first team came out to make the switch, and they didn’t have the necessary parts. New appointment, new attempt—they didn’t have the parts, either. Then we, the customers, were asked to order the parts. We dutifully did so, and parts were sent to our house. Another service appointment was made. Now a third team came out. They removed our fridge doors with difficulty, needing to borrow my husband’s tools to do so. Only after they removed the doors did they decide to open the box of parts that Sears had sent us. Guess what? Wrong parts! In duplicate! The door needed to be reinstalled now, after the refrigerator contents (including expensive medication) had gotten nice and warm. Time to make a fourth appointment. I made it clear to the Sears employee on the phone that I didn’t want to mess around with part-ordering; I just wanted him to solve the problem. He gave me a new appointment and lots of assurances. I blocked out yet another day for Sears. Oddly, the day before the appointment, we never received that standard call telling us when to expect someone at our house. I tried to make inquiries, but no one was able to help me. (This is a persistent theme: Sears’ left hand has no clue what its right hand is doing, and it is unable to find out.) I was told to call 1-800-4MY-HOME anytime after 5 a.m. CST on our scheduled delivery day and I could learn when to expect someone at our house. I woke up early on the alleged delivery day and called to inquire. No answer. I went online to have a chat with a rep named Florine. After many apologies (Sears associates are well trained in the art of apologizing), I was given a 24/7 phone number to use—the “online solutions team.” I called while I was still online with Florine, and heard “Our office is currently closed.” When I reported this to Florine, she said, “Sara, I understand how inconvenient this could be for you.” Indeed, Florine. Indeed. So, of course it turned out that my fourth Sears appointment had vanished. Incredulous, I made a new appointment with a fellow by the name of Howard. This time, I took careful note of my order number and Howard’s employee number. New parts arrived at our house. Things seemed to be moving in the right direction. But alas. The day before our NEW fourth appointment, we didn’t get any call. Déjà vu. Could it be? That even armed with an order number, an employee number, and the rock-solid promise from this rock-solid company, that another appointment had disappeared? Yup. And all those numbers I had? They meant nothing. They were as worthless as a Sears promise. I took the situation to the Twitterverse. Sometimes shame serves as a motivator. And do you know what? I think it worked. Because later that day, I was miraculously notified of a new appointment that I’d never even had to make. It was scheduled for the next day. The next day arrived: the third appointment for the fourth attempt to switch our door hinges. Some hapless fellow arrived, struggled mightily, and miraculously managed to accomplish the task. Let the trumpets sound! Oh, but too bad: there were missing parts and some damage, too. I was at a loss now. Maybe Twitter would have an opinion. Again, Twitter delivered. Two days later, I was contacted by Meghan B., who was the first person in your company to demonstrate any degree of understanding and follow-through. She offered me, shockingly, a brand-new replacement refrigerator. After I got assurances that our “old” refrigerator wouldn’t be just thrown away, I agreed and arrangements were made for delivery. I reiterated—in writing—that the new refrigerator should have handles on the left and hinges on the right. Everyone was on the same page. The future looked bright. But this was Sears. So when the brand-new fridge arrived, the handles were on the wrong side. Delivery aborted. A second new-fridge date was set. Schedules arranged, etc. On the second new-fridge day, we got a call from the delivery team when they were on their way. My husband said, “I may be able to save you a trip. Take a look at the fridge on the back of your truck and see what side the handles are on.” Do you want to guess what side the handles were on? I’ll tell you: the wrong side. 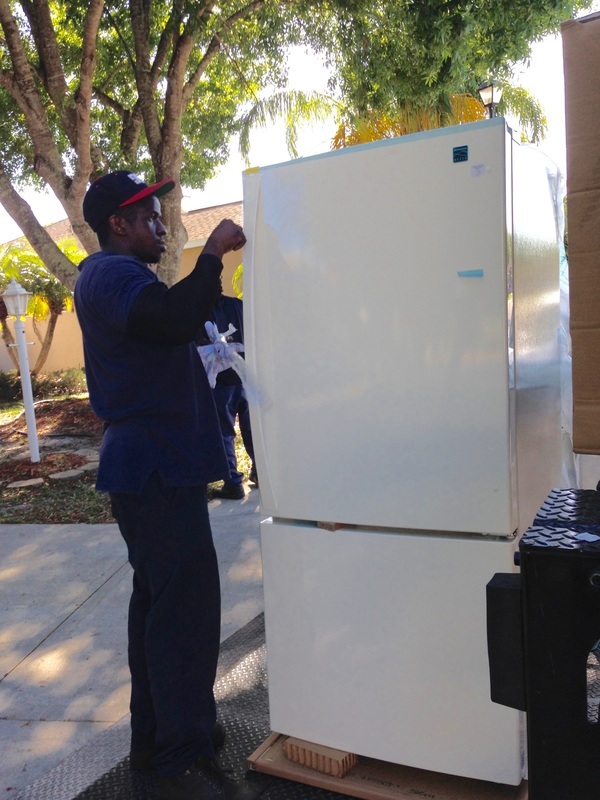 A third new-fridge delivery date was set. Now I received an unsolicited call from some service-focused person at Sears who not only offered me a $100 Sears gift card but assured me that our third replacement refrigerator would be “pre-inspected” to ensure that it was correct. Surely nothing could go wrong now. Not with a pre-inspection. The third replacement-fridge appointment day arrived. People were placing bets. How would you have bet, Mr. Lampert? Would you think that on try #3, with a pre-inspection, Sears would get it right? You’re a billionaire; surely you know how to make good bets. Well, if you bet that Sears would screw it up again, you would have won. Because even with pre-inspection, the door orientation was 100% wrong. Now there were phone calls and emails and more promises made. I love this line from an email from Meghan at Sears: “The new delivery date is now this Saturday, 3/14. I have spoken with multiple escalation groups, delivery teams, and the warehouse to ensure that it arrives correctly this time. Please let me know as soon as it arrives.” Multiple escalation groups. That’s what it’s come to. Because scores of people were watching this debacle unfold on social media, you may have heard a collective cheer go up on March 14. That was the day we finally got the fridge we’d been struggling to get for so very long. And the day that I could at last say that I never, ever have to do business with Sears again. And that really is a happy ending. I am still awaiting my $100 Sears gift card. You can be sure that I will not hold my breath. This tragicomedy has gone on for three pages, so I won’t bother expounding on robber barons, Ayn Rand, and heartless greed. I think the evidence speaks for itself.